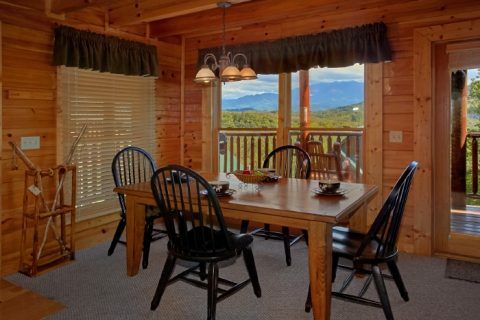 For your Smoky Mountain vacation, book "Catch of the Day," a beautiful cabin in Pigeon Forge, TN! Located in Sherwood Forest, a gated community with beautiful views of Mt. LeConte and other mountains in the national park. During the warm summer months, you'll also have access to a resort swimming pool through Sherwood Forest. 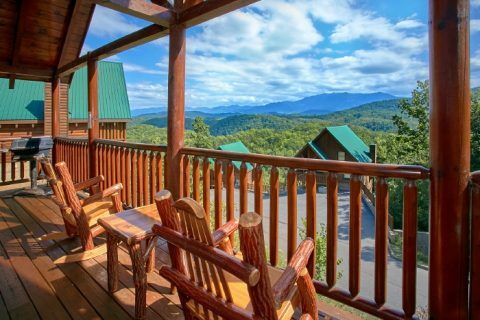 Better yet, this resort community boasts an incredible location mere minutes from traffic light #10 in Downtown Pigeon Forge. 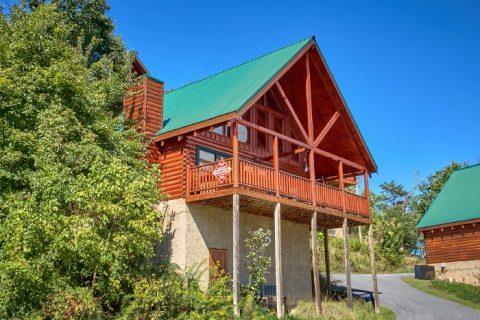 Not only is this cabin only a few miles away from downtown attractions like Dixie Stampede, but it also provides easy access to Gatlinburg via the "Spur Road." 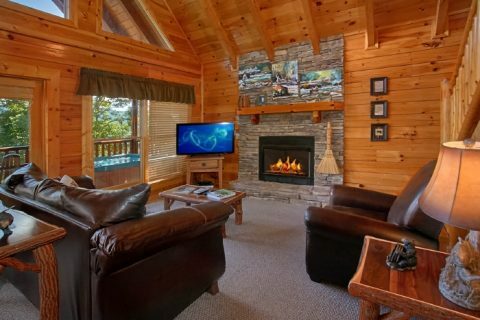 After you return from a fun-filled day exploring the Tennessee mountains, your comfortable cabin retreat is a great place to relax before your next adventure. Enjoy barrier-free handicap access from the parking area onto the covered, wrap-around deck to sit back in a porch chair, the bubbling water of the hot tub, or just enjoy the beautiful mountain views. 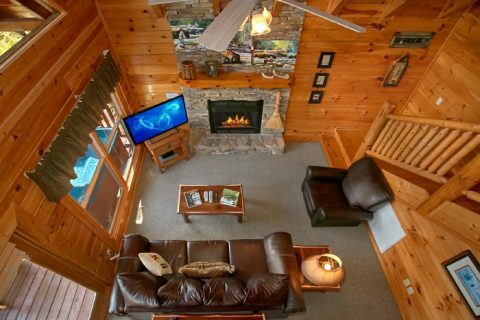 Inside, you'll find a cozy living room area with a stacked-stone gas fireplace and comfortable furnishings. 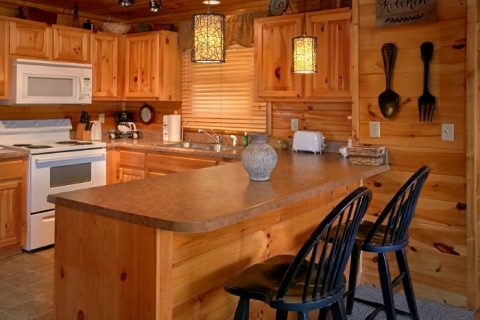 For preparing delicious meals in your cabin, be sure to take advantage of your rental's fully equipped kitchen with a breakfast bar. 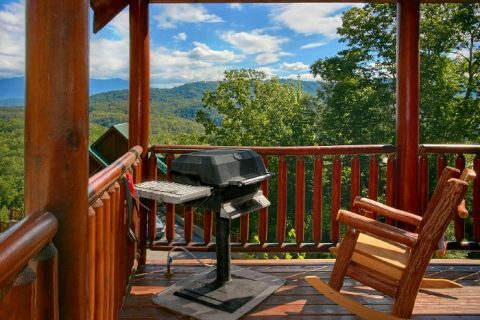 Your rental also has a propane gas grill for grilling delicious meals year-round. 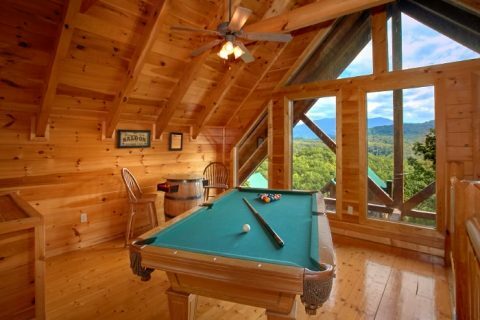 For great in-cabin entertainment, enjoy playing a round of billiards or set the high score on the arcade game in the game room loft. 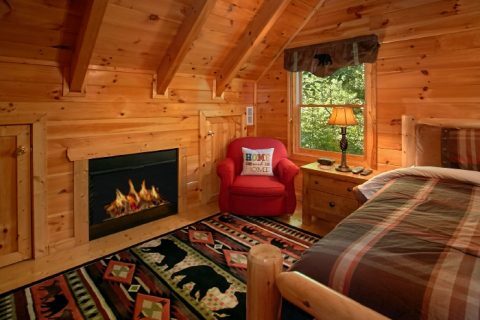 This room features beautiful picture windows that show off this cabin's superb view. 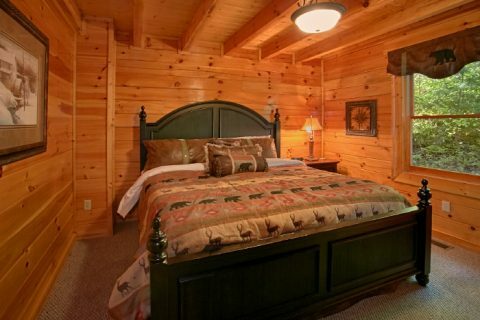 When you're ready to get a great night's rest, this cabin that sleeps 6 guests in comfort offers 2 private bedrooms that each offer king-size beds. 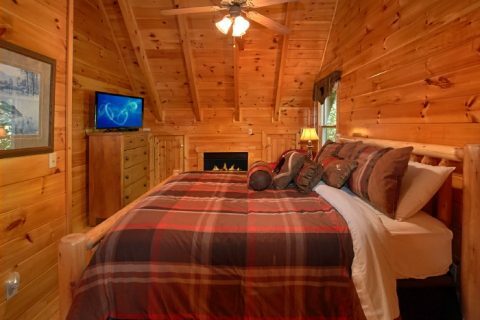 Both bedrooms offer flat screen televisions, private bathrooms, and ample closet space. 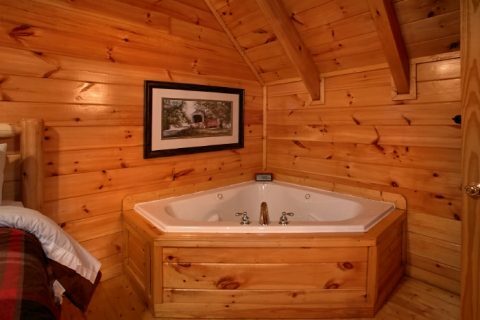 Additionally, the upstairs bedroom is a romantic suite complete with a fireplace and a jetted tub. In the living room, the sleeper sofa provides comfortable space for 2 more guests. 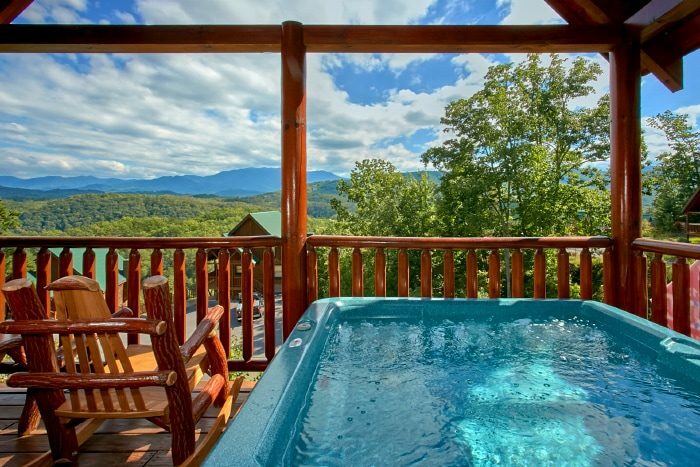 After a restful night, you'll be refreshed for another day of adventure in Pigeon Forge and the Smokies! It's a breeze to plan your day and research the area's top attractions with your rental's wireless Internet access! 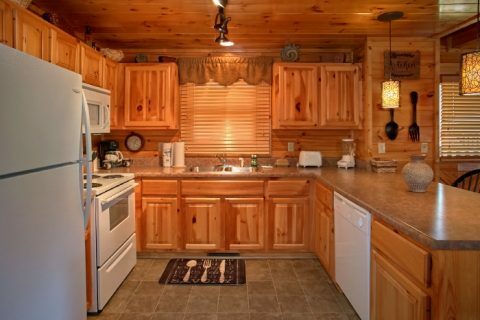 With paved resort roadways, level parking for two vehicles, a convenient location, and excellent amenities, "Catch of the Day" is a great cabin for a romantic getaway or a small family vacation. 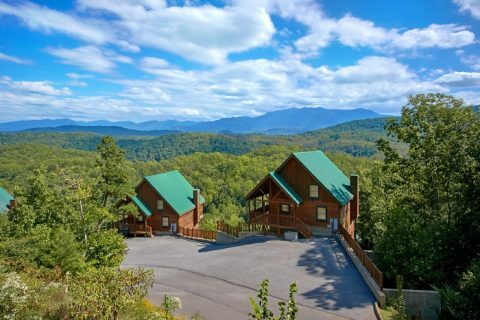 Book your Sherwood Forest cabin online today with Cabins USA to save 15% on this Pigeon Forge cabin with a fantastic view!